Although women tend to publish fewer research articles than men, their articles are downloaded and cited at similar rates, and at slightly higher rates in the US. More women than ever before are engaged in research around the world but while numbers are close to parity in some sectors like biomedicine, the physical sciences are lagging behind, according to a wide-reaching analysis by Elsevier. The report, Gender in the Global Research Landscape, finds that women now account for more than 40% of researchers in nine out of 12 of regions examined. The figure is a marked improvement on the previous period (1996-2000) when just one region reached this level. But the physical sciences, including engineering, energy, computer science, mathematics, physics and astronomy, lag significantly behind with only around 25% women. The proportion of women researchers is largely similar across the materials science sector in the EU, US, UK, and Australia. 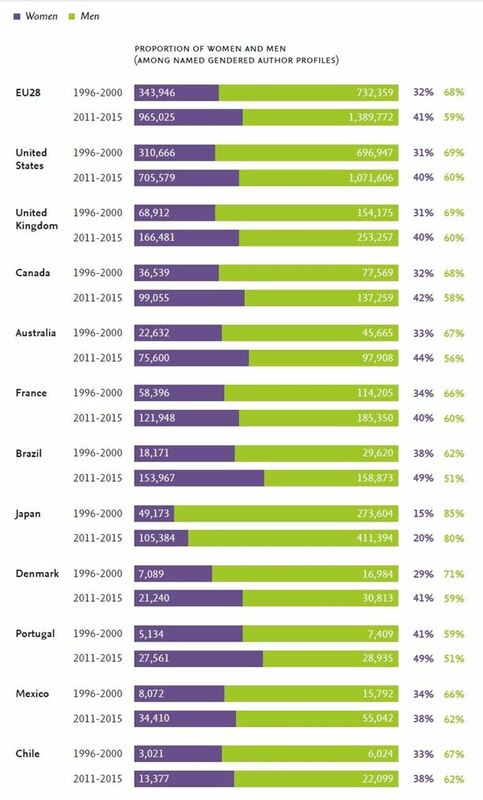 But Japan remains largely male-dominated, with women making up just 12% of researchers. Portugal, at the opposite end of the spectrum, continues to lead the way with women accounting for 43% of materials science researchers. As well as the gender makeup of the research community, the report looked at the tangible outputs of research, such as papers and reviews. 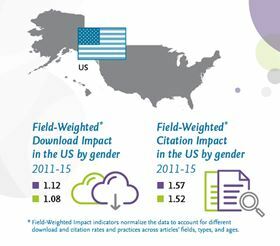 Although overall women produce less than men, and are less likely to be listed as first or corresponding authors on papers, the impact of that research output in terms of downloads and citations is largely similar. The reasons underlying these trends are complex. One contributing factor could be that women, the report finds, collaborate less than men and tend to be less mobile on an international level. The highest impact papers are often associated with researchers that are most internationally mobile of which women make up a smaller proportion. This trend is exacerbated in engineering, where women account for only 3.7% of most highly cited authors. But the report’s analysis indicates that women author a slightly higher proportion of top interdisciplinary papers. “Progress is occurring in terms of increased participation of women in research, albeit incrementally and unevenly, which is a sign that efforts to encourage women to engage in research, including in the science, technology, engineering, and mathematics fields, are gaining traction,” says Dr Holly Falk-Krzesinski, Elsevier’s Vice President of Strategic Alliances-Global Academic Relations. Despite the positive indications, more still needs so be done to counteract the ‘leaky pipeline’ of women’s post-graduate careers and the tendency to gravitate towards the biomedical rather than physical sciences. Proportion and number of researchers by gender (among named and gendered author profiles) for each comparator and period, 1996–2000 vs. 2011 –2015. Sources: Scopus, Genderize, NamSor, and Wikipedia. 11–12 March 2019Hall 3, Henry B. Gonzalez Convention Center, Texas.